When the body goes through a phase of rapid change elastin bands within the skin tear that expose stretch marks on the surface. This is mostly experienced by women during pregnancy or people who suddenly gain and lose several pounds within a short span. In the initial stage, these marks to have a purple-reddish appearance. However, if left untreated they ultimately merge with the skin revealing shades of white. Older stretch marks are more difficult to treat and some might need more invasive methods. It is thus imperative to use a combination of treatments to fade these scars while they are still fresh. While stretch marks can’t be entirely avoided or removed, it is possible to minimize their appearance. Treatment methods should aim at moisturizing and hydrate the skin both internally and externally. This can maintain the health of the skin and fade the appearance of scars. The almond is native to India, the Middle East, and Africa. Almonds are a rich source of oil and fatty acids, which make its availability in oil-form a natural outcome. The nut contains 50% fat besides protein, carbohydrates fibre, and minerals. It also contains B vitamins and a high supply of Vitamin E.
Almond oil is used in many cosmetics for its emollient activity due to its high oil content that is beneficial in protecting and healing the lipid equilibrium of the skin. Linoleic acid, which dry skin lacks, can be replenished by almond oil as it nourishes the skin and prevents the loss of moisture. It also contains a high amount of Oleic acid, known to facilitate the transportation of fatty acids through the skin. These fatty acids are known to successfully reach the deeper layers of skin, promoting wound healing and restoration. The fatty acid content in almond oil increased the production of valuable eicosanoids hormones that have anti-inflammatory effects. Other beneficial contents of the oil like squalane and tocopherol gives skin a tight and toned appearance. Further, the oil contains numerous antioxidant flavonoids obtained from the skin of almonds. These flavonoids promote various skin benefits comparable and similar to those derived from the potency of catechins found in green tea. Stretch marks can be targeted by using almond oil both internally and externally. While studies have proven that a 15-minutes massage using a bitter almond oil can prevent stretch marks during pregnancy, it can also be used to reduce scars. Before using almond oil topically, it helps to exfoliate the skin to remove dead cells, increase circulation and open pores to make the skin more receptive to the benefits of the oil. Although it is best to use the oil after a shower, it can be used during the day to replenish and maximize benefits. Almond oil works as a great carrier and can be combined with the essential oil of choice known to work well on stretch marks. It can also be combined with other creams and lotions. To increase the intake of almond oil, use it in cooking or salads. It goes well with smoothies, juices and protein shake. It is beneficial to consume almond oil by itself, take 2 to 3 tablespoons of warm almond oil during the day. It is advisable to make your own almond oil at home to have control over the quality and type of almonds for the oil. Use a blender or an oil press to extract the oil. Store the oil in a dark container in a cool place out of sunlight. Almond oil applied topically or ingested orally provides anti-inflammatory benefits. Almond oil contains a host of polyunsaturated fatty acids that keep the skin hydrated and soft. These fatty acids increase the production of beneficial eicosanoids hormones, which prevent the skin from losing moisture. When the almond oil is applied to stretch marks, the increase in eicosanoids boosts circulation and oxygen to the affected areas. Internally or externally almond oil provides anti-inflammatory support and set the healing process in action minimizing stretch marks. Almond oil is lightweight and the easily penetrates the skin making it a beneficial topical aid against stretch marks. Once it enters the skin, the oleic acid content makes it easy to transfer the fatty acids down to the dermis. These oils then work from within the skin to make it supple and minimize the appearance of scars. Almond oil provides the skin antioxidant benefits through its high content of vitamin E.
Vitamin E promotes the growth of new skin cell and boots cell regeneration to nourish skin and help heal and fade scars. Vitamin E applied topically can soothe and calm the redness and irritation in the case of freshly formed inflamed stretch marks. It can be used safely during pregnancy to keep stretch marks at bay. It also contains vitamin A that promotes cell regeneration and healing. Rapid body weight fluctuations can exacerbate the appearance of stretch marks. Using almond oil both topically and as part of the diet can support healthy weight loss minus the side effects of loose skin and stretch marks. It is known to be a laxative that can help shed fat and boost weight loss. Its oil content forms a part of healthy fats necessary to support the body during phases of intense change. Before applying almond oil to the skin, a patch test should be done, rule out any allergies and test the oil quality. Almond oil can turn rancid with a musty smell depending on the quality and due to improper storage. Rancid oil can completely negate the beneficial effects; encourage the formation of free radicals, toxicity and other dangerous side effects. People with nut allergies should definitely avoid both oral and topical applications. The truth is, stretch marks are something that almost every woman has to deal with at some point in time. However, hydrating the skin from inside out and vice-versa is key to minimizing their appearance. 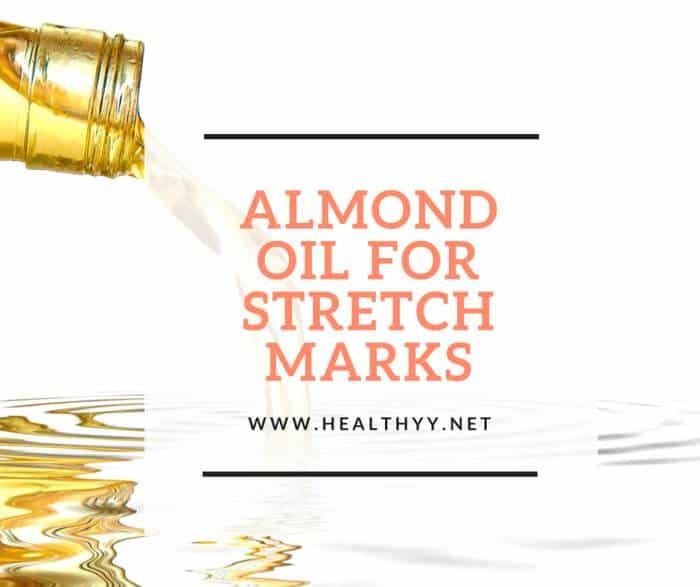 Almond oil should thus form a part of a treatment plan that incorporates a healthy diet and exercise to keep the skin healthy and minimize stretch marks.